It proves helpful, at least for the non-academic reader, to state what these proofs are in rather simple ways. I will also give at least one reason why opponents find the argument(s) not convincing. The cosmological argument “relates to the existence of the universe” (250). This argument starts with cause. The cause of the universe must be (a) God beyond the universe. This argument can be refuted by those who reject it in numerous ways. For example, “The universe is unexplainable without God, so it is simpler not to believe in God’s existence” (250). In the end the argument comes down to this: It is better to believe in something, or Someone, than nothing! The dialectical argument relates to the processes by which we reflect on the place of meaning. The consequences, for example, of not believing are so drastic that one has no choice but to finally believe that God exists. But the objector sees this as a red herring since theistic arguments do not point us to a traditional God as understood by those who generally use the argument. The historical argument argues that modern science confirms accounts of nature that we can also see in sacred scripture so scripture must be true, and the God it refers to must exist. This is where miracles are often used in apologetics. Miracles that violate the rules of nature point to a transcendent God who enacted them. But one can argue, just as convincingly it seems to me, that there have been so many unjustified evils in the word that God probably does not exist. The ontological argument is related to the concepts of God and existence. In its core sense this argument says that the idea of an infinite God would be unthinkable to our minds if God actually does not exist and did not imprint it there. Another form of this argument arises in mathematics. The nature of the infinite implies the existence of an infinite God. But against this argument it can be argued that the idea of God, at least in principle, cannot tell us anything about whether a God really exists or not. The phenomenological argument seeks to relate proof to direct human experience. One aspect of this argument reasons that since people have a consciousness of God then this implies his existence. A similar element of this argument would say that because people innately desire for transcendence then there must be a transcendent God. The problem with this argument, according to the skeptic’s response, is that not enough can be known from experience to really prove the existence of God. The sociological argument relates to how people relate to one another in human societies. From general consent it is argued that most people throughout history have believed in God, so God must exist. Further, philosophers across time and place have developed ideas consistent with the existence of God so human reason rightly points toward the real existence of God. The skeptic would retort that there are reasonable, open-minded people who do not accept God’s existence thus this unbelief stands as evidence that a good God who wants people to believe in him must not exist. The teleological argument relates to the order and design of the universe. It is one of the most pervasively used arguments for God used by evangelical Christian apologists. If natural laws were slightly different, life would not be possible, so they must have been designed by the God who creates living things. Another form of this argument appeals to human language by saying that since humans can communicate with each other there must be a God who taught us this communication. The common response against this popular argument is that nature is filled with imperfections and mishaps so there cannot be an intelligent designer, or at least there is not a good God who designed things as we really know them. The transcendental argument seeks to relate the question of God’s existence to the rationality of the world. The imperfection we see in things suggests the existence of the perfect being against which we compare the imperfect. But it is reasoned that if we can build a system of thought that does not depend on belief in God then such belief is not necessary. The transcendental argument would reply by saying that there could be no discoverable laws of morality, logic, mathematics or science without a divine lawgiver. Nathan Schneider deftly explains each of these eight major proofs commonly used to appeal for God’s existence. What makes his book unique is that he does this by telling a compelling story about how various people have used these arguments over the centuries. 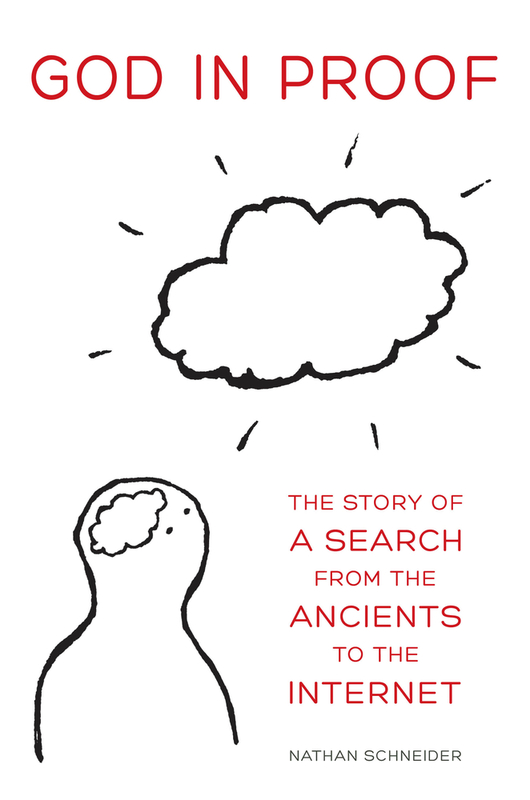 He tells this story by exploring the ideas that people have held about God, faith and reason. Through an exceptionally clever way of presenting his story he helps the modern (non-technically trained) reader understand just how close people of faith, and people of no faith, really are to one another when their arguments are rightly understood within their own context. One could conclude that both sides see the same evidence but each draws very different conclusions. Clark takes the words out of my heart. I agree and will share more from this amazingly well-done book tomorrow. I’m sorry to say I find this a sub-par apologetic. At the same time it’s over-simplifying, it’s overly-complex and at times non-sensical. I also don’t think it excels at representing/explaining the strength of the 7 arguments. One small example of the confused nature of this article is “This argument can be refuted by those who reject it in numerous ways. For example, “The universe is unexplainable without God, so it is simpler not to believe in God’s existence.” A) Non-sensical b) ‘numerous ways’ yet that is the best statement? C) I’ve never heard anyone object to the Cosmological argument with this. In general I’m sad to say, as one who agrees with all of the arguments, I believe the author tries very hard but comes up short in all respects. I’m definitely intrigued. Perhaps for me it will be an important first venture into the subject as I have never been much of a student of the proofs, which is sort of strange given that I was once upon a time a philosophy minor. Henry Madete-Asega liked this on Facebook. Thomas Heard liked this on Facebook.